Repeat Rule: May be repeated for a maximum of 4 credits. 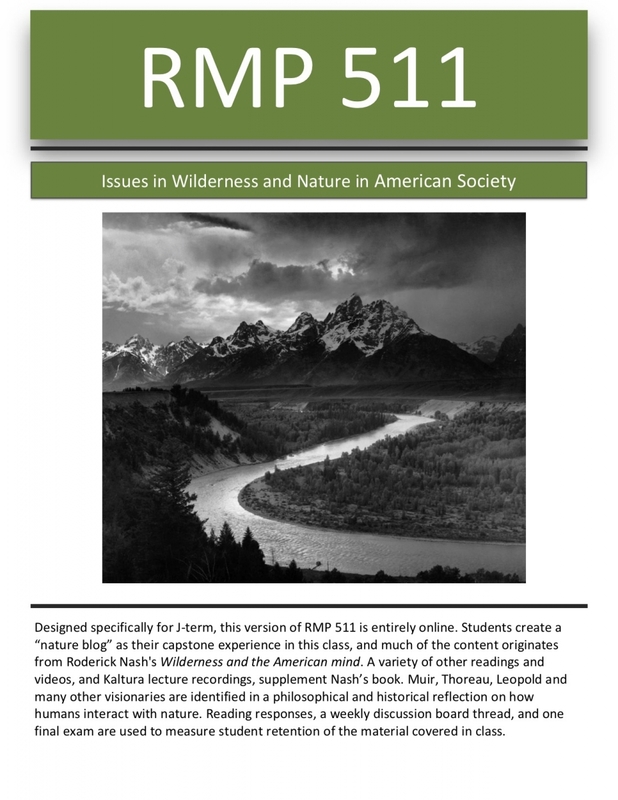 Provides students with an overview of the evolving relationship between wilderness/nature and American society. Examines the philosophy, ethics, and societal values in American society and its relationship to our natural wilderness. Recent issues are used as case studies in order for students to articulate, defend, and critique the ethical issues presented. Students are responsible for understanding and applying philosophical approaches developed by philosophers, writers, and activists associated with the wilderness, sustainability, biodiversity, hunting, suburban sprawl, environmental activism, endangered species, organic foods, and genetic engineering. Section Comments: (RMP 511.1BB) Online course; no campus visits required. Designed to provide first and second year RMP majors the opportunity to observe and practice leadership skills in clinical and community-based settings. Students complete a 40-45 hour practicum at an approved site. Successful completion of a practicum is prerequisite to the professional internship, RMP 664. Students are responsible for transportation and housing. Prereq: RMP 490. Permission required. May be repeated for a total of 4 credits. Cr/F. Elementary applied statistical techniques; tables, graphs, cross-clarifications; central tendency and dispersion; correlation and linear regression; confidence intervals and hypothesis testing. Other statistical classes including ADM 430, BIOL 528, ADMN 420, EREC 525, HHS 540, MATH 439, MATH 539, OHIL 412, MATH 644, PSYC 402 cannot be used to satisfy the major requirement. This is, all majors must take SOC 502 even if they have taken an introductory statistics course in another department. 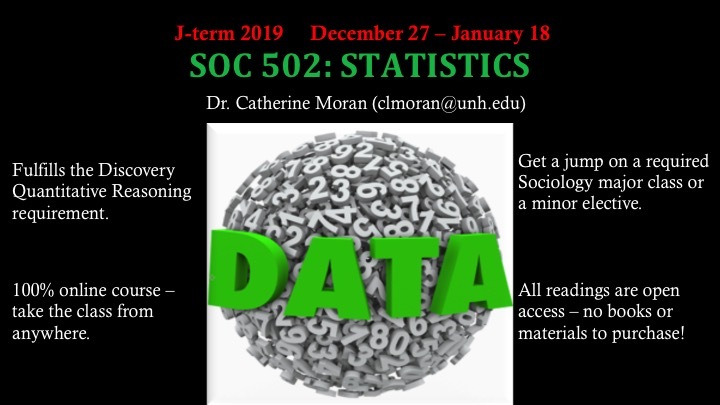 A student can, however, petition to receive eight credits for two introductory statistics courses, if and only if, SOC 502 is taken after the student became a sociology major and took their first statistics course prior to declaring SOC as their major. Majors cannot receive credit for statistics courses taken after they have declared SOC. Section Comments: Online course; no campus visits required. Students will need to have consistent acces to internet. This course introduces students to the study of major social problems in contemporary society, including poverty, discrimination, inequality, crime, violence, and environmental degradation. Explores how and why people come to view certain social conditions as problematic. Also explores the consequences of and possible solutions to contemporary social problems. This course fulfills the requirement in the Social Science category of UNH's Discovery Program. Environmental and Society focuses on the complex interactions between human communities and the natural world. The course considers the interconnected ways that social systems, the built environment, and related technologies produce environmental changes, and in turn how shifts in resources, air, water quality, climate, biodiversity, and ecosystems force societies to adapt. 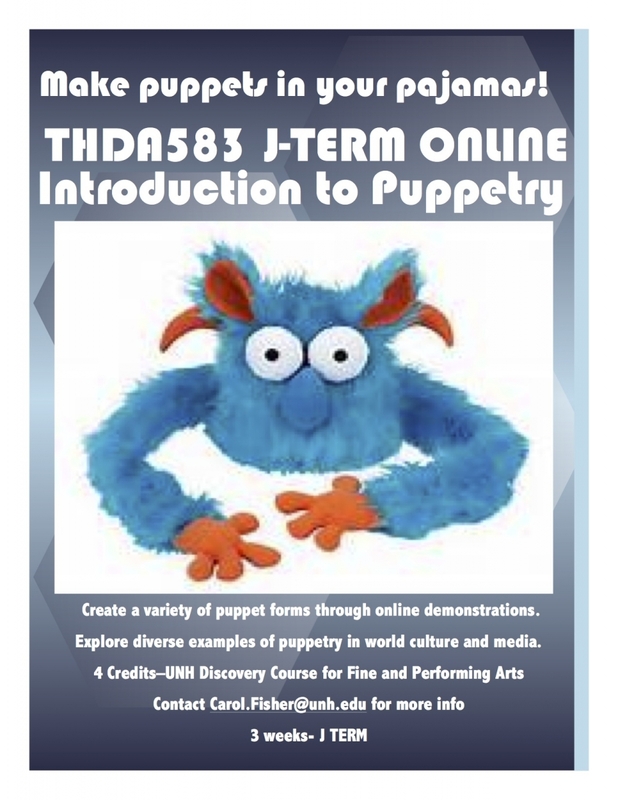 This course fulfills in the Environment, Technology, and Society category of UNH's Discovery Program. Section Comments: Online course; no campus visits required. An overview of the history and current status of social welfare policy in the United States. Considers the origins, development, and analysis of significant policies, values, attitudes and other issues related to the social welfare system and the delivery of service. Focuses on policy analysis from a social and economic justice perspective. Section Comments: THDA 531 is a Study Away Program in London. Online dates: December 28 - January 20; Traveling dates: January 7 - January 17. There is a corequisite of INCO 589. You must apply for this program through the COLA Center for Study Abroad in order to be registered. Find more information at www.cola.unh.edu/study-abroad. Section Comments: THDA 532 is a Study Away Program in London. Online dates: December 28 - January 20; Traveling dates: January 7 - January 17. There is a corequisite of INCO 589. You must apply for this program through the COLA Center for Study Abroad in order to be registered. Find more information at www.cola.unh.edu/study-abroad. Section Comments: Textbook and materials kit needed.